Phytochemicals are chemicals of plant origin. Phytochemicals (from Greek phyto, meaning “plant”) are chemicals produced by plants through primary or secondary metabolism. They generally have biological activity in the plant host and play a role in plant growth or defense against competitors, pathogens, or predators. Phytochemicals generally are regarded as research compounds rather than essential nutrients because proof of their possible health effects has not been established yet. Phytochemicals under research can be classified into major categories, such as carotenoids and polyphenols, which include phenolic acids, flavonoids, and stilbenes/lignans. Flavonoids can be further divided into groups based on their similar chemical structure, such as anthocyanins, flavones, flavanones, and isoflavones, and flavanols. Flavanols further are classified as catechins, epicatechins, and proanthocyanidins. Phytochemists study phytochemicals by first extracting and isolating compounds from the origin plant, followed by defining their structure or testing in laboratory model systems, such as cell cultures, in vitro experiments, or in vivo studies using laboratory animals. Challenges in that field include isolating specific compounds and determining their structures, which are often complex, and identifying what specific phytochemical is primarily responsible for any given biological activity. Without specific knowledge of their cellular actions or mechanisms, phytochemicals have been used as poison and in traditional medicine. For example, salicin, having anti-inflammatory and pain-relieving properties, was originally extracted from the bark of the white willow tree and later synthetically produced to become the common, over-the-counter drug, aspirin. 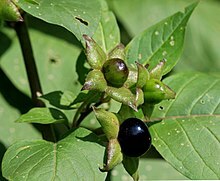 The tropane alkaloids of A. belladonna were used as poisons, and early humans made poisonous arrows from the plant. In Ancient Rome, it was used as a poison by Agrippina the Younger, wife of Emperor Claudius on advice of Locusta, a lady specialized in poisons, and Livia, who is rumored to have used it to kill her husband Emperor Augustus. The English yew tree was long known to be extremely and immediately toxic to animals that grazed on its leaves or children who ate its berries; however, in 1971, paclitaxel was isolated from it, subsequently becoming an important cancer drug. As of 2017, the biological activities for most phytochemicals are unknown or poorly understood, in isolation or as part of foods. Phytochemicals with established roles in the body are classified as essential nutrients. The phytochemical category includes compounds recognized as essential nutrients, which are naturally contained in plants and are required for normal physiological functions, so must be obtained from the diet in humans. Some phytochemicals are known phytotoxins that are toxic to humans; for example aristolochic acid is carcinogenic at low doses. Some phytochemicals are antinutrients that interfere with the absorption of nutrients. 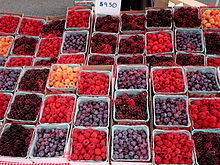 Others, such as some polyphenols and flavonoids, may be pro-oxidants in high ingested amounts. Nondigestible dietary fibers from plant foods, often considered as a phytochemical, are now generally regarded as a nutrient group having approved health claims for reducing the risk of some types of cancer and coronary heart disease. Eating a diet high in fruits, vegetables, grains, legumes and plant-based beverages has long-term health benefits, but there is no evidence that taking dietary supplements of non-nutrient phytochemicals extracted from plants similarly benefits health. Phytochemical supplements are neither recommended by health authorities for improving health nor approved by regulatory agencies for health claims on product labels. While health authorities encourage consumers to eat diets rich in fruit, vegetables, whole grains, legumes, and nuts to improve and maintain health, evidence that such effects result from specific, non-nutrient phytochemicals is limited or absent. For example, systematic reviews and/or meta-analyses indicate weak or no evidence for phytochemicals from plant food consumption having an effect on breast, lung, or bladder cancers. Further, in the United States, regulations exist to limit the language on product labels for how plant food consumption may affect cancers, excluding mention of any phytochemical except for those with established health benefits against cancer, such as dietary fiber, vitamin A, and vitamin C.
Phytochemicals, such as polyphenols, have been specifically discouraged from food labeling in Europe and the United States because there is no evidence for a cause-and-effect relationship between dietary polyphenols and inhibition or prevention of any disease. Among carotenoids such as the tomato phytochemical, lycopene, the US Food and Drug Administration found insufficient evidence for its effects on any of several cancer types, resulting in limited language for how products containing lycopene can be described on labels. Phytochemicals in freshly harvested plant foods may be degraded by processing techniques, including cooking. The main cause of phytochemical loss from cooking is thermal decomposition. A converse exists in the case of carotenoids, such as lycopene present in tomatoes, which may remain stable or increase in content from cooking due to liberation from cellular membranes in the cooked food. 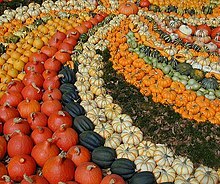 Food processing techniques like mechanical processing can also free carotenoids and other phytochemicals from the food matrix, increasing dietary intake. In some cases, processing of food is necessary to remove phytotoxins or antinutrients; for example societies that use cassava as a staple have traditional practices that involve some processing (soaking, cooking, fermentation, etc. ), which are necessary to avoid getting sick from cyanogenic glycosides present in unprocessed cassava. ^ Breslin, Andrew (2017). “The Chemical Composition of Green Plants”. Sciencing, Leaf Group Ltd.
^ a b c d e f Molyneux, RJ; Lee, ST; Gardner, DR; Panter, KE; James, LF (2007). “Phytochemicals: the good, the bad and the ugly?”. Phytochemistry. 68 (22–24): 2973–85. doi:10.1016/j.phytochem.2007.09.004. PMID 17950388. ^ Harborne, Jeffrey B.; Baxter, Herbert; Moss, Gerard P., eds. (1999). “General Introduction”. Phytochemical dictionary a handbook of bioactive compounds from plants (2nd ed.). London: Taylor & Francis. p. vii. ISBN 9780203483756. ^ a b c d “Phytochemicals”. Micronutrient Information Center, Linus Pauling Institute, Oregon State University, Corvallis, Oregon. 2017. Retrieved 12 February 2017. ^ a b c d e f Heneman, Karrie; Zidenberg-Cherr, Sheri (2008). “Publication 8313: Phytochemicals” (PDF). University of California Cooperative Extension. ^ “Carotenoids”. Micronutrient Information Center, Linus Pauling Institute, Oregon State University, Corvallis, Oregon. July 2016. Retrieved 12 February 2017. ^ a b “Flavonoids”. Micronutrient Information Center, Linus Pauling Institute, Oregon State University, Corvallis, Oregon. November 2015. Retrieved 12 February 2017. ^ Sneader, W. (2000). “The discovery of aspirin: A reappraisal”. BMJ (Clinical Research Ed.). 321 (7276): 1591–1594. doi:10.1136/bmj.321.7276.1591. PMC 1119266. PMID 11124191. ^ Landau E (22 Dec 2010). “From a tree, a ‘miracle’ called aspirin”. CNN. Retrieved 18 June 2014. ^ a b Michael (1998). Alkaloids : biochemistry, ecology, and medicinal applications. New York: Plenum Press. p. 20. ISBN 978-0-306-45465-3. ^ Timbrell, John (2005). The poison paradox : chemicals as friends and foes. Oxford: Oxford Univ. Pr. p. 2. ISBN 978-0-19-280495-2. ^ a b c d “Why is it important to eat vegetables? Nutrients”. ChooseMyPlate.gov, USDA Center for Nutrition Policy & Promotion, US Department of Agriculture. 16 January 2016. Retrieved 12 February 2017. ^ “What is an essential nutrient?”. NetBiochem Nutrition, University of Utah. ^ Iwasaki, S (April 1998). “Natural organic compounds that affect to microtubule functions”. Yakugaku Zasshi. 118 (4): 112–26. PMID 9564789. ^ Bjeldanes, Leonard; Shibamoto, Takayuki (2009). Introduction to Food Toxicology (2nd ed.). Burlington: Elsevier. p. 124. ISBN 9780080921532. ^ Shaw, D (December 2010). “Toxicological risks of Chinese herbs”. Planta Medica. 76 (17): 2012–8. doi:10.1055/s-0030-1250533. PMID 21077025. ^ Oxford Dictionary of Biochemistry and Molecular Biology. Oxford University Press, 2006. ISBN 0-19-852917-1. ^ Halliwell, B (2007). “Dietary polyphenols: Good, bad, or indifferent for your health?”. Cardiovascular Research. 73 (2): 341–7. doi:10.1016/j.cardiores.2006.10.004. PMID 17141749. ^ “Fiber”. Micronutrient Information Center, Linus Pauling Institute, Oregon State University, Corvallis, Oregon. April 2012. Retrieved 12 February 2017. ^ “Health claims: fiber-containing grain products, fruits, and vegetables and cancer; Title 21: Food and Drugs, Subpart E, 101.76”. U.S. Food and Drug Administration. 5 January 2017. Retrieved 8 January 2017. ^ “Health claims: Soluble fiber from certain foods and risk of coronary heart disease (CHD); Title 21: Food and Drugs, Subpart E, 101.81”. U.S. Food and Drug Administration. 5 January 2017. Retrieved 8 January 2017. ^ “Common questions about diet and cancer”. American Cancer Society. 5 February 2016. Retrieved 8 January 2017. ^ “Code of Federal Regulations, Title 21, Part 101, Food Labeleing, Subpart D, Specific Requirements for Nutrient Content Claims, Section 101.54”. US Food and Drug Administration. 1 April 2016. Retrieved 12 February 2017. ^ Aune, D; Chan, D. S.; Vieira, A. R.; Rosenblatt, D. A.; Vieira, R; Greenwood, D. C.; Norat, T (2012). “Fruits, vegetables and breast cancer risk: A systematic review and meta-analysis of prospective studies” (PDF). Breast Cancer Research and Treatment. 134 (2): 479–93. doi:10.1007/s10549-012-2118-1. PMID 22706630. ^ Smith-Warner, S. A.; Spiegelman, D; Yaun, S. S.; Albanes, D; Beeson, W. L.; Van Den Brandt, P. A.; Feskanich, D; Folsom, A. R.; Fraser, G. E.; Freudenheim, J. L.; Giovannucci, E; Goldbohm, R. A.; Graham, S; Kushi, L. H.; Miller, A. B.; Pietinen, P; Rohan, T. E.; Speizer, F. E.; Willett, W. C.; Hunter, D. J. (2003). “Fruits, vegetables and lung cancer: A pooled analysis of cohort studies”. International Journal of Cancer. 107 (6): 1001–11. doi:10.1002/ijc.11490. PMID 14601062. ^ “Electronic Code of Federal Regulations, Title 21, Chapter I, Subchapter B, Part 101.78. Health claims: fruits and vegetables and cancer”. US Government Printing Office. 9 February 2017. Retrieved 12 February 2017. ^ Schneeman BO (9 July 2015). “Qualified Health Claims: Letter Regarding “Tomatoes and Prostate, Ovarian, Gastric and Pancreatic Cancers (American Longevity Petition)” (Docket No. 2004Q-0201)”. Office of Nutritional Products, Labeling and Dietary Supplements, Center for Food Safety and Applied Nutrition, US Food and Drug Administration. Retrieved 12 February 2017. ^ a b c Palermo, M; Pellegrini, N; Fogliano, V (2014). “The effect of cooking on the phytochemical content of vegetables”. Journal of the Science of Food and Agriculture. 94 (6): 1057–70. doi:10.1002/jsfa.6478. PMID 24227349. ^ Dewanto, V; Wu, X; Adom, KK; Liu, RH (2002). “Thermal processing enhances the nutritional value of tomatoes by increasing total antioxidant activity”. Journal of Agricultural and Food Chemistry. 50 (10): 3010–4. doi:10.1021/jf0115589. PMID 11982434. ^ Hotz, C; Gibson, R. S. (2007). “Traditional food-processing and preparation practices to enhance the bioavailability of micronutrients in plant-based diets”. The Journal of Nutrition. 137 (4): 1097–100. doi:10.1093/jn/137.4.1097. PMID 17374686. Higdon, J. An Evidence – Based Approach to Dietary Phytochemicals. 2007. Thieme. ISBN 978-1-58890-408-9. Rosa, L.A. de la / Alvarez-Parrilla, E. / González-Aguilar, G.A. (eds.) Fruit and Vegetable Phytochemicals: Chemistry, Nutritional Value and Stability. 2010. Wiley-Blackwell. ISBN 978-0-8138-0320-3.